If YOU ARE GOD ! Recently, Radio Sai broadcast a talk by Prof. Venkataraman in the series MUSINGS. Many listeners have written to us asking that the transcript be made available. H2H takes pleasure in doing so. The transcript follows. We hope you would like it and if you do, perhaps you could draw the attention of others who might benefit by reading it. Loving Sai Ram and greetings from Prasanti Nilayam. 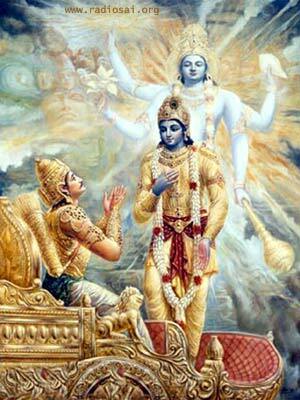 You said that Krishna tells Arjuna that "I separate Myself from Myself so that I can love Myself". It means that I, the saint, I, the scholar, I, the fool, I, the thief, I, the murderer, I, the debauch, are all in essence, I, the God. Krishna further explains that all attachments and desires a person exhibits are only reflections of the Divine Love that He has within Him and hence inter alia expressions of the Divine Bliss that He, the God really IS. When ordinary human intelligence, which is nothing but a spark of the Supreme Divine intelligence, plans events and happenings meticulously, the mighty Cosmic Intelligence would definitely have planned the design parameters of His sojourn in various bodies in various births spread over God knows (or I should know but apparently don't in My embodied State) how many millions of aeons. That is, I, the God, in my disembodied State have already decided the various roles I would be playing in various births. Under the circumstances, why worry? Let Me be me. If I want to drink let me drink. If I want to enjoy let Me enjoy. If I want to be merry let Me be merry. Because that is what I decided to do before I separated Myself from Myself. I have covered Myself in the embodied state with a Self-created delusion. Yet since the plot, scenes, dialogue, and delivery of the whole drama is pre-scripted, whether I am aware of it or not I am still God. Under the circumstances let me enjoy the life I am leading whatever it is. If I do a wrong thing let Me enjoy the wrong doing. If as a result of that wrong doing I suffer let me enjoy that suffering. If I am insulted let me enjoy that insult. Let me watch with enjoyment how beautifully I, in another role, in another embodiment, am insulting Myself in the insulted body. Let Me enjoy the loss I, the God have caused to Myself or enjoy My own cunningness, or the meanness with which I myself in another body have caused that loss to Myself. Let Me enjoy My own intelligence or the lack of it. Let Me enjoy My own stupidity or Scholarship. Let Me enjoy My being a scoundrel or a saint. In this context then, what is sin and what is merit? There are no such things. Both are illusions I have covered My deluded mind with, in the embodied state. In essence it all boils down to what our Beloved Swami says" The past is beyond recovery. The future is not certain. The given moment is now. Do the best you can". That is I, the God have already played out my previous role. Though I, the God in my disembodied State have designed My future roles also, since I have chosen to hide that knowledge from Myself in the embodied state, I do not know My future role. So at best in My embodied State I am aware of the role I am playing right now. The person who is living this moment is none other than the Omnipresent Lord Himself. So this present is nothing but the part of one long Omnipresence. In that Omnipresence there is no past and no future. fine let Me be so. Ultimately I AM, I AM. AHAM, AHAM ASMI. So we reach the conclusion that I, the God, whatever role I am playing in the present life should remember that it is a role chosen by Me only and I should enjoy thoroughly what I am undergoing. That is I, the God am beyond dualities. I AM GOD. Let me not compare Myself with others simply because there are no others. All roles are Mine. I alone AM. So let Me be always, in our Beloved Swami's words, "BE HAPPY.BE HAPPY. BE HAPPY." That is what the listener wrote in his letter to us. By the way, the opening words of the listener are his paraphrase of what he thinks Krishna says. As far as I can recall, in the Krishna-Arjuna dialog as we broadcast, nowhere does Krishna speak the words our listener has written. Thus, these words would seem to be his understanding of what Krishna teaches. When the One becomes many, it is that One who is masquerading in many forms. Everything that happens in Creation is pre-ordained by The One or God Almighty. Thus, whatever ‘I’ the individual or Jivatma do is already ordained by ‘I’ the Paramatma. There is no difference between ‘I’ the One who ordained and ‘I’ the one who wears the vesture and performs various actions. Therefore, all that ‘I’ do has been decided by me and me alone in advance. Since ‘I’ am the One who decided and ‘I’ also am the One who is acting now, where is the question of sin or merit, bad or good? The question does not arise at all and ‘I’ can therefore jolly well do what ‘I’ please. That, roughly speaking, summarises what, according to me, the Listener has said. I hope my paraphrase is fair and accurate. I am sure you will agree that the problem that the listener is raising is a tough one. After reading his letter many, many times over, I did a lot of thinking. Let me now share with you what I feel about the whole issue raised by our listener. Obviously a complex remark like this has to be dealt with slowly and carefully at various levels. And clearly, every level of analysis can reveal only a bit of the truth. After that, one has got to patiently put together the pieces and try to make some sense of it all. I hope you will keep this in mind, while I place before you my response. Let me start off with the analogy of a drama troupe, an analogy that is quite useful in this case. The troupe members stage plays and although the different actors play different roles, they all have read and know the whole script. And although each one of them knows what the play is all about, yet while actually play acting they do not show it. Instead, they react or appear to react to situations as they happen. So what does this mean for us? Firstly, life is a Drama scripted and directed by God. The official dialog is Dharma, but just as some actors of ordinary drama ad lib, as they say in America, some actors in the Cosmic Drama also deviate from the official script and ad lib, meaning they stray from Dharma. In other words, knowing the script in advance and following it meticulously are two different things. Let us remember this while we move on to other perspectives. Next, I would like to consider water flowing in a stream. As we all know, water is made up of water molecules, each molecule being a combination of an oxygen atom and two hydrogen atoms. The water molecule is extremely tiny, and there are trillions of them in one cubic centimetre of water. It is because the molecule is so tiny that we cannot ever see them with our naked eye. Now scientists have shown that these tiny molecules are restless and keep moving randomly as also with various velocities. Since the molecules are tightly packed, they naturally collide all the time with each other. To understand this phenomenon, just imagine a big ground say like the hill view stadium in Prashanti Nilayam, full of people. At the end of the function or program to attend which all these people came, the members of the public would all rise and start walking off in different directions. Naturally, in the process, many people would be bumping into others. Basically this is the result of congestion, and what happens in gases and liquids is something similar. Naturally the collisions are more frequent in liquids than in gases, on account of the higher density. This phenomenon of random molecular collisions is referred to in physics as Brownian motion and was explained for the first time by none other than Einstein, in a landmark paper published in the year 1905. Let us now zoom out and instead of looking at individual molecules in the water, look at the entire stream. We would then find that the water now appears to be flowing fast in one direction that is downstream. In other words, the molecules all move en masse in one specific direction. What I want you to note from this example is that when the same system is observed at two different levels or two different scales of length as we would say in physics, we see two different things. In one case we observe random motions while in the other we see a well directed drift. Paramatma is the One who ordains, but here on Earth, actions are performed by the Jivatma [except of course in the case of the Avatar, which anyway we are not considering here]. The Jivatma on Earth cannot claim the same rights and privileges as Paramatma. I mean we know this to be true even in ordinary, so-called secular life. One man may be the President of a country while another may be just a commoner. In many respects, the two are equal. Both can vote, both have to pay taxes, and both are subject to the same laws. Yet, the President has powers and privileges that the commoner does not enjoy. Please bear this in mind. There are two basic levels from which we can look at Creation. One is from above Creation and the other is from within or below, whichever way you prefer to describe it. This is rather like looking at the entire stream standing on the bank on the one hand, and getting into the water and looking at individual molecules on the other. In other words, while making statements, we must be careful about the perspective we are adopting. If we are viewing from above Creation, then we get one perspective while if we are looking from below, we get an entirely different perspective. When one is above, there is sheer Oneness – that is what Vedanta says and that also is what Swami tells us repeatedly. To use jargon, this is the state of Pure Advaitam. Clearly, in this state there is neither good nor bad. When our friend says, “In this context then, what is sin and what is merit? There are no such things. Both are illusions I have covered My deluded mind with, in the embodied state,” he is no doubt right but he is obviously speaking from the perspective of sheer Oneness. I am sure everyone including our friend, who I hope is listening, would agree. Let us now climb down from this dizzy state, and get into Creation. That is to say we observe the Universe from within the Universe. We look around and see what we normally describe as either good or bad. How did these things suddenly pop up? The answer has been given by our friend. He says, “both are illusions I have covered my deluded Mind with.” That is right. To put it in Vedantic terms, when one enters the world of duality, which, unfortunately is what we all are immersed in, we inevitably see duality around us. True it is a trap set by the Mind, but then we are caught in the trap – that we have to accept. So, duality results when the Mind is allowed to get deluded. The Mind should not be allowed to get deluded and make a person assume that Paramatma and the Jivatma are identical. No doubt they both are Divine in origin. True that qualitatively they are same, just as the wave and the ocean are qualitatively the same. But the differences must also be understood and respected. The Paramatma is the Divine in Totality while the Jivatma is but an aspect of that Totality. If Paramatma is the entire fire, the Jivatma is but a tiny spark of that fire. In other words, the Jivatma who is under the spell of duality cannot claim license to do anything and everything saying, “After all it is ‘I’ who ordained everything”. Contrary to the point of view adopted by our listener, below Creation or in the state of duality, there IS a clear difference between the two ‘I’s that our writer is implicitly referring to. The ‘I’ who preordained is the Universal ‘I’. It is, as our listener writes, the Atma or AHAM. But the ‘I’ who performs actions in the world is the lower or individual ‘I’, and this lower ‘I’ is bound by ego. Therefore there is no way this lower ‘I’ can claim perfect identity with the Higher or Universal ‘I’. That identity can be claimed only when the lower ‘I’ attains, what is referred to in Vedanta as Self-Realisation, which is the same as reaching the perfect state of Advaitam. And when one attains that state, that person will never say, like our friend does, “If I want to drink let me drink. If I want to enjoy let Me enjoy. If I want to be merry let Me be merry,” and so on. That is because a person in the Advaitic state does not recognise such a thing as drinking and being merry. Being merry is connected with body-consciousness, and a person in the state of Oneness is by definition above body-consciousness. On the contrary, whatever actions such a Self-Realised though still embodied Soul would perform would be a true reflection of God. The above point is very important. Again and again Swami tells us that Divinity is where Prema or Pure Love, Daya or Compassion, Kshama or Forbearance exist. When a person attains Self-Realisation, these virtues shine forth in such a person, as they did in the case of Ramana Maharishi and Ramakrishna, to name two examples. Can we ever think of these people making such comments as quoted earlier? I hope you agree with what I have said so far. Basically what I am saying is that we must recognise that though we individuals are in principle God, we are not so in practice. You will surely recall what Swami often says in the context. He says, “The difference between you and Me is that I know I am God but you do not.” Now why does Swami say that? The point is simply this. It is not enough to know that one is God in the head. One must FEEL it in the Heart. It is only when we feel Prema, Daya and Kshama constantly in our Heart that we truly rise to the level of the Divine or, to use the language of philosophy, attain Self-Realisation. Assuming all the above, let me now proceed to the next step in my analysis. The question before us is: “What precisely is my role when I am immersed in duality?” The answer has been clearly spelt out by Swami. Quoting Shankara often, He asks us to shun bad company, avoid seeing bad, focus only on seeing good, hearing good and doing good, etc. I am sure even our friend would agree without any reservations whatsoever, that this is what Swami exhorts us to do. If you agree with what I have just said, then we must ask, “If there is no such thing as good and bad, then, what precisely does Swami mean by asking to be good and all that?” The answer is simple and straightforward. Swami’s advice is meant for one who is immersed in duality that is to say for you, me and our listener friend, and NOT for one who has achieved Realisation. None of us can claim to have come anywhere near Self-Realisation, which automatically means that we all are unfortunately steeped deep in duality. That is why we see pleasure as pleasure and pain as pain. Hence, immersed as we are in duality, we cannot make the sort of arguments our friend has offered and pretend that there is no difference between Dharma and Adharma. We just have to accept that for us this difference exists, and that we have to steer clear of the bad and stick to the good. Not merely that. Swami teaches an important lesson, which incidentally has been taught by every one of the earlier Avatars. This is an important point and I do hope you will pay careful attention. Incidentally, this point has also been made by Krishna in the Krishna-Arjuna Dialog. The point is simply this. Suppose there is a person who has achieved Self-Realisation. According to the text book for this person, clay and gold are not different in value, there is no such thing as sin or merit, and so on. That does not mean that this person can do what he or she likes! On the contrary, the Lord is very clear about what such a person shall do. In brief, this Realised person must lead an ideal life that others would be inspired to copy. That precisely is what our Swami is doing all the time. I do hope all that I have said thus far would make it quite clear to everyone, including our listener friend, why Swami keeps on saying MY LIFE IS MY MESSAGE. We should also not forget what Bhagavan adds as a corollary. He says: YOUR LIFE SHOULD BE MY MESSAGE. And what does that mean? Many things, among which is that we cannot drink and be merry as our listener seems to advocate!